The following is a copy of the constitution of the church as signed by the charter members: “Covenant entered into by the undesigned at the constitution of a church called Concord, Sumter County, Alabama, 29th of November, A.D. 1845; viz:— We the undersigned being Baptist by immersion of our faith and as we trust have given ourselves to God and one another in Gospel Bonds, do by the assistance of God agree to observe our duty to God, to ourselves, and Brethren, and to the World according to the directions laid down in the New Testament have agreed to adopt the following by-laws for our government in conference. 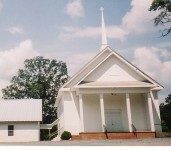 On November 16, 1851, Brother Parker joined Rehoboth Baptist Church, at Pushmataha, upon its constitution by a letter of dismission from Concord Baptist Church. Most of his ministry was in Clarke and Marengo Counties. 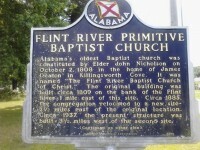 The first recorded minutes of the action of the church that we have was in May 1857. The business of the church ran rather smooth on through the war between the States. However, there are no minutes from September, 1863 until June 1864, these being lost. We Baptists of today often wonder how the Baptist churches in early days carried on their business. 1st Open conference with prayer and praise. 2nd Invite visiting brethren to seats with us. 3rd Open the door of the church for the reception of members. 5th Enquire into the fellowship of the church. 6th Call for voluntary acknowledgements. 8th Call for reading the minutes. These conferences were most always held on Saturday before the regular preaching service. The fifth rule above was the proper time for one member to state any maladjustment with a fellow member of the church or for general contention in the church. Here the charges were made against various members. 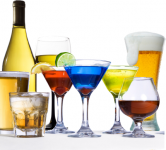 A few of the more common charges were: non-attendance, swearing, drinking, dancing, fighting, unchristian-like conduct, and general grievances. For personal reasons none of these charges will be mentioned. Here, may we clear up the misconception of the act of “turning members out of the church” or exclusion of members. It seems to be of general opinion that exclusion meant that a member was forever excluded. This only happened in a case where the excluded member failed to make proper acknowledgements to the satisfaction of the church. Then the church on accepting the acknowledgements would restore the member into the fellowship of the church. Thereby the member was merely excluded from the fellowship of the church and the church did not pass final judgment on his membership. The person who was excluded could not join another church in good standing until proper acknowledgements were made to the former church. 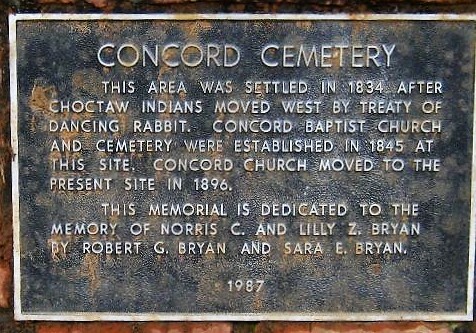 It was at this time when the Negroes withdrew and constituted the Pleasant Hill Baptist Church, which stands near the site of the old Concord Baptist Church. One note of interest concerning the Negroes occurs in the March 1868 minutes, viz:— “That Elder J. F. Johnson be granted privilege to receive and baptize colored people and to preach to them on the first Sabbath and Saturday before, every month at this place.” He was permitted to hold conference but all business of importance must come before the white membership for decision. The old time revivals must have been in their height back in 1858. A full account was given of a series of meetings in which five preachers participated, viz:—J. K. Ryan, Hardy Yarbrough, Ambrose Yarbrough, W. Jacob Parker, and M. Wolf. The services began at nine o’clock A.M. with a prayer meeting and preaching at 11 A.M. by one preacher and the invitation by another. They would have dinner on the church grounds and preaching again at 2 P.M. after the same manner as the 11 A.M. services, and preaching again at 7 P.M. in the same order as before. As a result of this meeting 16 whites and one black candidate were baptized. 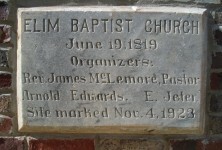 Then in 1868 there were 88 members added by baptism alone. 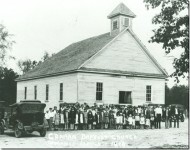 It was in this year that the church voted to extend an arm of the church to the Shugahloaf Schoolhouse. Then in September the church voted to receive the 22 persons that were baptized as a result of a meeting at Shugarloaf Schoolhouse into Concord Baptist Church. Then in October 1868 there was a mass withdrawal of 19 members from the church, but no reason was given. It could have been for the purpose of constituting a new church. There was another break in the minutes from February 1877, at which time a new book was started, until December 1892. 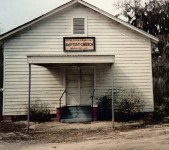 It was also moved to let the old church building stand where it was. The moving of the church caused a split in the church and 20 male and 41 female members withdrew and formed a “new church” in the “old church”. 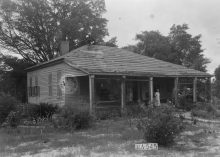 It is not shown in the minutes if and when these members came back into the “Concord Baptist Church”, but it is said that they did, for the old church house was demolished in January 1919 and the inside ceiling sold for fifty dollars. One amusing thing that is related, but not on record, about this split in the church was the fact that both churches wanted the old church Bible and it was mysteriously shared between the churches for some time. It is evident that this faction has completely been settled, for the old Bible is in the church now. On two other occasions the church was almost torn apart, one in 1892 and one in 1895-96. These two occasions will merely go as mentioned in this review of the church. Now as to some interesting facts taken at random from the one hundred years of service of the church. 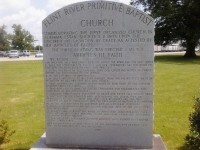 June 19, 1858—The church held a service of foot washing. 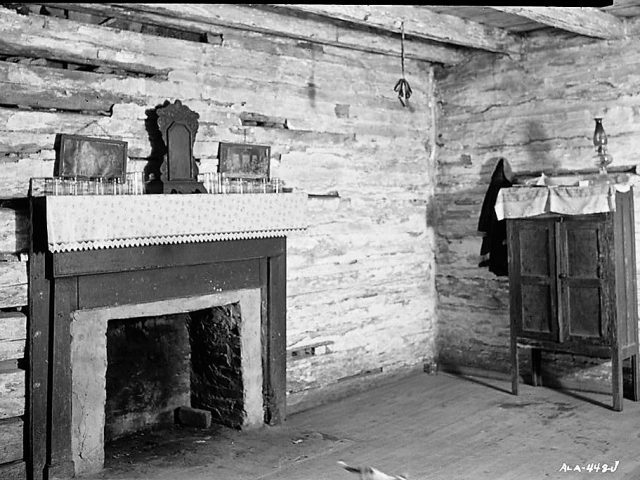 July 1858—A querry, “Is it prudent or imprudent for a member of a Baptist church to play or have a violin played in or about his house?” The answer was to be given in the next conference but the minutes were torn out of the book. February 1862—A special prayer meeting was called concerning the difficulty of the members. August 1922—Church gave Brother Miller $72 on a “Ford car”. August 1941—Church gave Brother Stone $50 on new car. The greatest membership was in 1868 with 193 members, and lost 106 members by the meeting of the Association in 1870 when they had 87 members. The longest tenure of any one pastor was J. W. Stone who served continuously for 15 years, while J. K. Ryan served the church four different times with a total of 14 years. The longest tenure of a church clerk was that of E. C. Garrison who served continuously for 22 years with Joe H. Bryan serving 16 years. Dr. David Bryan, who was ordained in 1907 by this church, is the grandson of David Bryan who was probably one of the first deacons of the church and a very outstanding member of the church for the first 25 years of its service. Dr. Bryan was Concord’s gift to foreign missions. He was a missionary in China for a number of years. He is now retired and living in Richmond, Virginia. Brother John Brock, the son of Brother D. W. and Mary Phillips Brock, who was ordained at Rehoboth Baptist Church at Pushmataha, can also be claimed as a son of Concord Baptist Church. He is now pastor of Moss Point, Mississippi, where he has been for many years. R. S. Gavin, who was ordained in 1897 at Concord, gave a useful life to the ministry of which most of his service was in Mississippi, until his death a few years ago. He was the son-in-law of D. W. and Mary Phillips Brock. 1*NOTE: L, A. Brock was elected deacon again July 1896 and resigned in September 1901. Thanks so much for this information. Zebulon Buckalew, Thomas Goodwin, and John and Mary Powell are my direct ancestors. 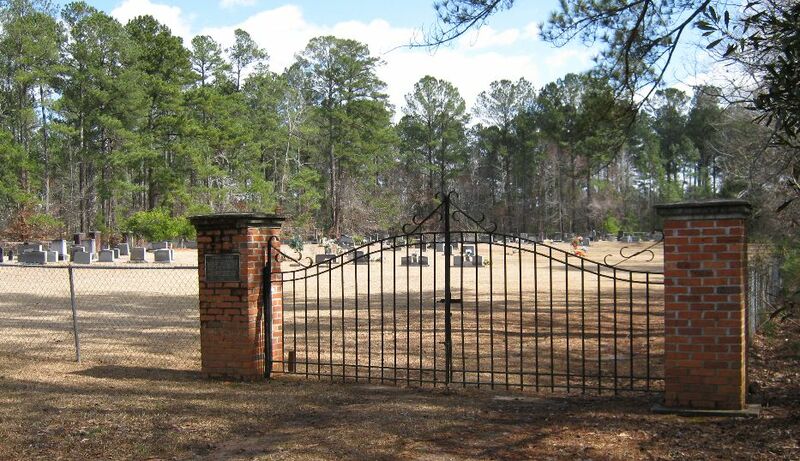 I have visited this cemetery.